This ontology describes sensors, actuators and observations, and related concepts. It does not describe domain concepts, time, locations, etc. these are intended to be included from other ontologies via OWL imports. New modular version of the SSN ontology. This ontology was originally developed in 2009-2011 by the W3C Semantic Sensor Networks Incubator Group (SSN-XG). For more information on the group's activities see: http://www.w3.org/2005/Incubator/ssn/. The ontology was revised and modularized in 2015-2017 by the W3C/OGC Spatial Data on the Web Working Group, see: https://www.w3.org/2015/spatial/wiki/Semantic_Sensor_Network_Ontology. In particular, (a) the scope is extended to include actuation and sampling; (b) the core concepts and properties are factored out into the SOSA ontology. The SSN ontology imports SOSA and adds formal axiomatization consistent with the text definitions in SOSA, and adds classes and properties to accommodate the scope of the original SSN ontology. 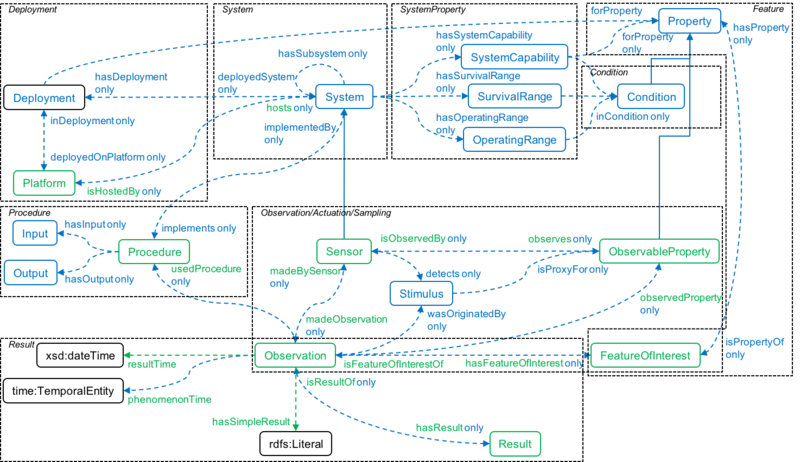 New modular version of the SSN ontology. This ontology was originally developed in 2009-2011 by the W3C Semantic Sensor Networks Incubator Group (SSN-XG). For more information on the group's activities see: http://www.w3.org/2005/Incubator/ssn/. The ontology was revised and modularized in 2015-2017 by the W3C/OGC Spatial Data on the Web Working Group, see: https://www.w3.org/2015/spatial/wiki/Semantic_Sensor_Network_Ontology. In particular, (a) the scope is extended to include actuation and sampling; (b) the core concepts and properties are factored out into the SOSA ontology. The SSN ontology imports SOSA and adds formal axiomatization consistent with the text definitions in SOSA, and adds classes and properties to accommodate the scope of the original SSN ontology. SSN follows a horizontal and vertical modularization architecture by including a lightweight but self-contained core ontology called SOSA (Sensor, Observation, Sample, and Actuator) for its elementary classes and properties. The initial SSN was developed with ontology engineers in mind as the primary audience. Due to the widespread adoption of SSN, the increasing role of citizen science, the strong focus on lightweight vocabularies by the Linked Data community, and vocabularies such as Schema.org, the ontology was streamlined. The new SSN introduces additional classes and relations on top of SOSA to model the capabilities of sensors and actuators, the compositionality of systems, and so forth to suit more complex needs or cases in which more provenance data is required, e.g., to improve reproducibility.